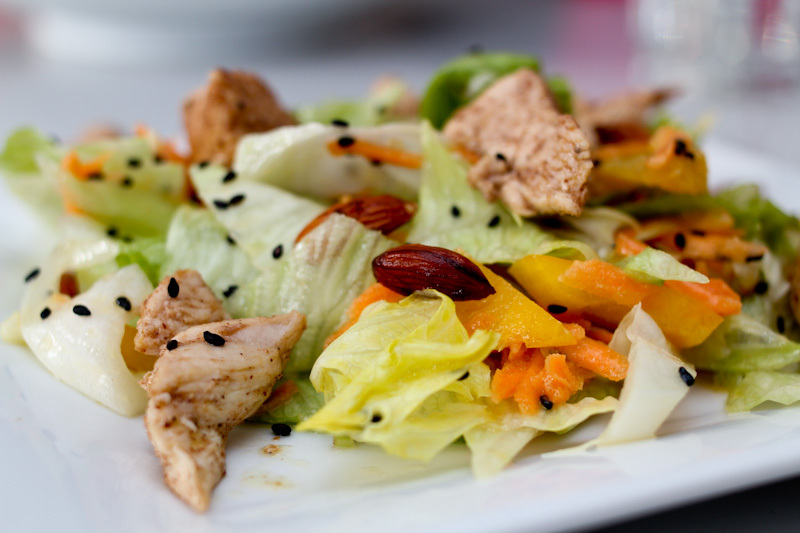 Every diner in California serves a version of Chinese chicken salad. Here is mine. You can make it in less than 30 minutes, which makes it a good healthy choice for weekdays. It is fresh and flavorful. The original inspiration is found in this book, I have tweaked the recipe and added some ingredients. Heat the oil and the five-spice over medium heat and add the chicken chunks. Season with salt & pepper. Stir occasionally and cook until done. About 5 minutes depending on the size of the pieces. Set aside, but leave the skillet. Meanwhile cut the lettuce, bell peper and spring onion. Peel and grate the carrots. Place it all in a large bowl. Roast the almonds for a few minutes in the unwashed skillet from the chicken. This will give the almonds some spice. Cut the oranges into segments and squeeze the rest of the juice over the salad. Combine everything and dress with mustard dressing. If you have been looking for a sweet, healthy, refreshing treat in the heat – well look no further. 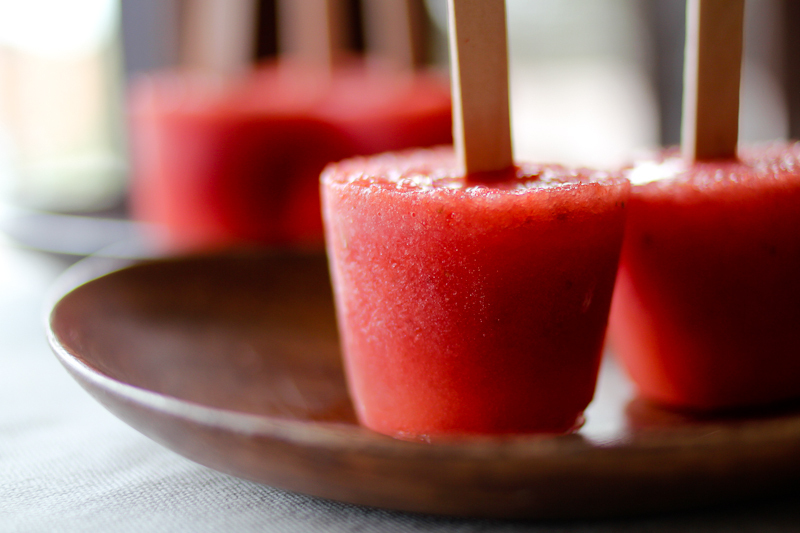 These watermelon strawberry popsicles must be your answer. If you need instant gratification, because the temperatures are way up there (read 100sF/40sC) or you are in the mood, well then you don’t even have to freeze them. It is an equally amazing smoothie. Cut the watermelon into chunks and blend with the water until smooth. Strain the watermelon juice to get rid of the seeds and pour back into the blender. Skip this step, if using a seedless watermelon. Add the frozen straberries and agave nectar and blend until smooth. Adjust sweetness to your taste and enjoy over ice or pour the strawberry watermelon juice into ice cream molds and freeze. Set your timer for about 30-45 min, then add the wooden sticks to the popsicles and freeze for another 4 hrs or overnight. If you don’t have ice cream molds, be creative and use small glasses or other little containers. I used 3 oz bath cups. This was a quick shot, but I want to share it with you anyway, because the pie is so cool looking and simple to make. The next time I make phyllo pie, I may take a better picture. So here is how I put the phyllo dough from the freezer to good use. Preheat the oven to 375 C/190 F.
Use a spring form cake pan, so you can easily remove the pie when done. Brush the spring form with melted butter and layer with phyllo dough, brushing each sheet with a thin layer of melted butter. Steam the broccoli florets a few minutes, then strain well. Cut the salmon fillets into big chunks. Place salmon and broccoli in the pie and simply crack the eggs on top. Bake for about 30 minutes or until the eggs are done. This is not a spicy pie, so serve with chive cream and a good dash of tabasco sauce. Sour cream with finely chopped chives seasoned with lemon juice, lemon zest, mustard, salt and pepper. You may also like these sweet recipes with phyllo dough. These muffins don’t look like anything special, but honestly one is not enough. Each moist bite is bursting with spices and subtle sweetness. Really, really good – and good for you – any time of day. Definitely a keeper! Put all the dry ingredients in a medium sized bowl and whisk them together. In a large bowl mix the butter, honey, egg and vanilla together and beat until well combined. Fold in the applesauce and carrots using a spatula. Bake for 15-20 minutes until the muffin tops are golden brown. So if you are in the Copenhagen area, I recommend a visit to Istid. I also hear Ice Cream Lab in Los Angeles is pretty awesome and it is definitely on my list of must-try-places for my next visit! Matcha is high quality powdered green tea with a bright green color. The tea plant is covered before picking to accentuate the beautiful color. One of the many health benefits of matcha is the high content of antioxidants. Matcha is also rich in Vitamin A, C and potassium. Ingesting the entire tea leaf thus receiving 100 % of the nutrients of the leaf is one of the reasons matcha is considered such a miracle elixir and simply superior superfood. I just came back from Japan where I enjoyed a daily matcha latte. Highly addictive. I also splurged on matcha treats. They all have the very unique, hard to describe, complex, slightly vegetative, umami taste with a subtle sweetness. Matcha has been an important part of Japanese culture for decades and is the tea used for the traditional tea ceremony. I think matcha has been underrated in the Western world, but things are changing and I notice matcha and recipes with matcha appearing in the trendsetting food magazines, eateries and coffee shops. When I googled “matcha is the new black” this recent article in TimeOut New York appeared confirming that matcha is indeed on the rise and popping up on restaurant menus all over – also in Copenhagen. On a final note – Japan exceeded all my high expectations. The people are friendly and respectful. The food is incredible and even fast food is served in ceramic bowls. It’s all about aesthetics and the Japanese certainly seem to understand the psychology of enhancing the joy of a meal. Check out the research by Charles Spence, an experimental psychologist at Oxford University, for more on how our environment affects the way we experience food and drink. Here is a brief teaser with some of his findings. By the way, did you know that Japanese people do not eat in the street? Food is supposed to be enjoyed sitting down – not in a rush from point A to B. A code of conduct I plan to stick to. I could go on and on about amazing Japan, but it’s time for a cup of matcha! Here is a suggestion for a quick lunch or dinner. Chop some kale and heat it on a pan with olive oil for a few minutes. Squeeze lemon juice over the kale, season with flaky salt and toss with cooked lentils e.g. beluga lentils and shaved parmesan. You may also want to add some finely sliced fresh fennel. I make my kids eat so much healthy food. When my 6-year-old son had to bring a cake to his class at school, he really wanted to bring a swimming pool cake. I have no idea how he came up with that, but of course I couldn’t say no to a cake challenge and I made him a swimming pool cake. I used a basic cake recipe and covered the cake with a cream cheese frosting. I cut marshmallows in half for tiles and used licorice lace for the divider and the stairs. Then I let gummy bears have some fun. Jello is not sold in Denmark, so for the water I made a simple syrup, which I colored with food color and thickened with sheet gelatin. The trick here is to watch the temperature. If you pour the jello when it is too warm, your frosting will melt and if it is too cold, it will have become too thick to pour. So you have to watch the jello carefully and as soon as it starts to set on the side of the bowl, your water is ready for the pool. To make a simple syrup bring 6 oz/175 ml sugar and 6 oz/175 ml water to a boil until the sugar has dissolved completely. Let it cool before adding the color. I used 5 sheets of gelatin to thicken the water. There wasn’t a crumb left by the end of the day! Since watching the Joe Cross documentary “Fat, Sick and Nearly Dead” and the sequel “Fat, Sick and Nearly Dead 2″, I have have made an effort to incorporate juicing in my diet. Watching Joe Cross transform his body from diseased to bursting with health was very inspiring and a bit of an eye opener with regards to the many benefits of juicing. So if you have a juice maker and need a quick boost of energy and a refreshing kick, then here is one of my favorites: celeriac and apples. The juice is mild in flavor and very refreshing plus the list of health benefits in celeriac is long. To name just a few, celeriac contains several minerals and vitamins, such as vitamin k and vitamin C. The root vegetable is also high in iron and antioxidants. Read more here. Try adding lemon, lime or ginger. Yum.